Investors who are long a stock may consider selling call options for enhanced cash flow. The premium collected represents the price of sacrificing further upside gains to your investment during the option period. Tenet Healthcare option trade potentially yields 1.2% over 10 days but the upside is limited to 4.9% capital appreciation on the stock over the same period. When selecting stocks for a retirement portfolio or a retiree, cash flow focused investors like I am would probably look at dividend yield. The preference is always for a sustainable company with a record of growing its dividends historically and does not trade at a rich valuation. However, this is not always the case. Retirees are especially exposed to fluctuations in their retirement portfolio value or when transitioning out of a job into retirement in the midst of an economic downturn. I suspect the risks do not end with market risks and inflation eating into the portfolio value. I can imagine there will be other factors like unforeseen expenses requiring a drawdown or redemption in funds, hence depleting the overall portfolio such as poor health, required repairs on the house, or a need to replace the family car. One approach to mitigate this risk could possibly be to adopt a buffer similar to the sinking fund approach for rainy days with an attempt to either have an additional or part-time income or to imply that into the required expenses and set this aside annually at a risk-free investment rate for liquidity and stability. Think of this as an insurance policy. This, however, impacts the commonly desired 4% depletion rate, which is the assumed rate of depleting the portfolio which does not impact the portfolio value. The next problem with dividend yield is that while investors actively seek out stable companies to invest, there is always that risk of a cut in dividends during a downturn which again impacts the ability to return over 4%. As such, I have been experimenting how to extract cash flow out of my portfolio regardless of the dividend I receive from my stock. If this company pays a dividend, the added cash flow enhances my overall yield. Everything comes at a price, and in this case, the price I pay is the opportunity cost of potentially forgoing capital appreciation in the share price. I have written about writing (or selling) options to earn a premium, which is the price of the option. By setting a strike price on the option above an acceptable upside limit and selling an option against an underlying stock that I own, I do not incur margin financing cost. The premium collected represents the earnings I receive, after deciding to forego or limit my potential stock appreciation to a comfortable limit. Here is an example. I wrote about Tenet Healthcare (THC) and its bond maturing in 2022 yielding 5%. I became interested in Tenet Healthcare for my growth portfolio for retirement savings because I had a view that with an increasingly aging population, healthcare infrastructure companies would be able to benefit over the long term. However, it seemed as I was looking into this stock in my January Fire Portfolio report that the debt load was high and bulk of the company's earnings were used to service interest on its debt. However, it became apparent to me that if the company could regularly use its cash flows to service the debt, there could be value in investing through its many debt offerings available to retail investors. Instead of buying the bond which at the time yielded 5.3%, I decided instead to own a piece of the company. While net operating revenues declined 4.5% to $18.3 billion, operating expenses were reduced significantly, resulting in an operating income of $1.6 billion in 2018 (a 5.8% increase from 2017 operating income). Bulk of this operating income is used to pay interest on debt. In 2018, about $1 billion was used to pay interest on Tenet Healthcare's debt which did not reduce significantly from 2017. My view is that the company would gradually pay down its debt using the cash flow from operations and, then subsequently, expand or return more cash to the shareholders. Tenet Healthcare trades at a forward PE of 13.4x and does not pay a dividend. Not exactly ideal for cash flow generation. However, the key concept is that I am willing to go long and hold this stock for a significant period of time. I have thus traded call options on this stock as in the picture below. THC currently trades at $30.50 and I have sold 2 ten-day call options with a strike price of $32 (4.9% higher than current share price). This means that in the next ten days, I am prepared to cap my potential upside by 4.9% on this stock (I actually bought 200 shares at $28 but that is beside the point). In return, I obtain a potential to earn $120 less costs. The value of the underlying 200 shares I bought is $6,100. If Tenet Healthcare climbs 4.9% to $32, I only gain $1.50 ($32 minus $30.50) on the underlying and $0.60 from the option premium. Excluding trading costs, in this scenario, I stand to earn $2.10 which is a 6.9% return. Assuming Tenet Healthcare tanks or stays flat, as a long position, I get to keep that premium and earn the $0.60, while I ride my losses on the share price. This sounds similar to investing in a dividend yielding stock, doesn't it? In this case, over 10 days, the potential return would be close to 2% ($0.60/$30.50). In this trade, I actually made some unrealized gain due to the share price movements during the day. Just looking at the closing price of $0.38, the yield would still be 1.2% over 10 days. I am, therefore, generating cash flow from a non-dividend yielding stock. I can, therefore, decide what to do with the cash flow. I could potentially protect myself and buy insurance through a put option or just continue to hold onto this stock since I planned to go long anyway. I can always have stop loss instructions to limit the downside and get back in at a lower price as well. 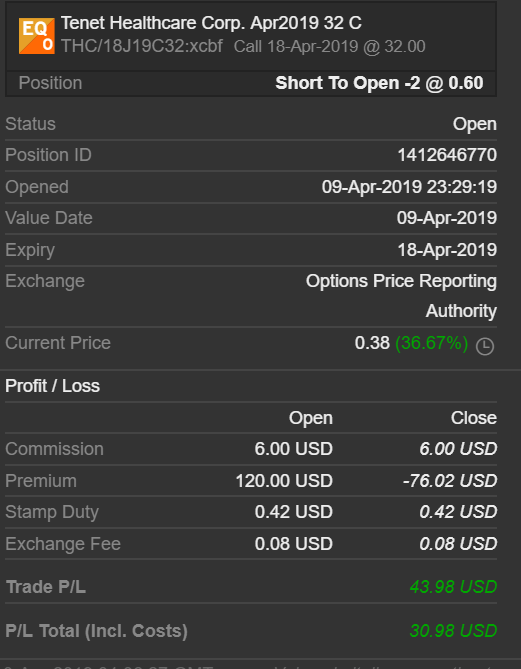 The point is, by using this trade, I am able to generate short-term (or long term depending on how long I want the option period to be) cash flow. This is particularly useful for a retiree. Sitting on a portfolio with a main focus on withdrawing funds from the portfolio, selling options could be a source of additional cash flow especially as the market corrects or drifts sideways. Option trading is not for every investor, and I do not recommend trading options without owning the underlying. However, the use of options to enhance yield or to protect your downside provides investors with more choices and wriggle room. Disclosure: I am/we are long THC. I wrote this article myself, and it expresses my own opinions. I am not receiving compensation for it (other than from Seeking Alpha). I have no business relationship with any company whose stock is mentioned in this article.